Peter Schmalenbach is a board member of the Neuwied chapter of nationalist AfD party and a party candidate for the 2016 state elections of Rhineland-Palatinate. 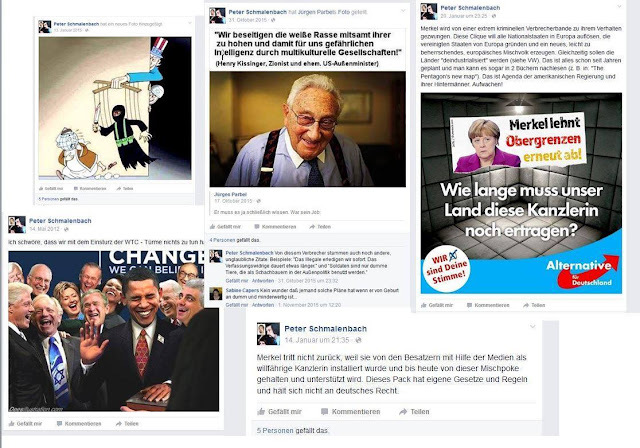 According to the Friedensdemo-Watch site, Schmalenbach has posted antisemitic conspiracy theories on his Facebook account (which has now been wiped out). For people who still think there's a difference between antisemitism and anti-Zionism, it should be noted that the conspiracy theories are not antisemitic, they're anti-Zionists. Schmalenbach believes that Zionists control Germany, the US, and ISIS. UK: "We are feeling more and more unsafe"